BFM's Lima Clear Coat Steel seats are selling so fast, we thought we'd remind you of their claim to such popularity in hope that you'll order yours soon! Whether you are in a climate that allows year-round outdoor dining, or move your patrons indoors for the cold season, you know holidays are busy times for restaurants and other dining venues. Many restaurants redecorate, refresh, and even upgrade their dining spaces for the holidays. With savings up to 33% and more on select BFM Seating chairs and table tops and bases, now is the time to order your restaurant furniture for holiday upgrades or stock up for the next outdoor season! We have extra-special Black Friday Pricing of up to 66% on select items from BFM Seating's Delray collection, featuring powder-coated aluminum frames, batyline seats and backs, and synthetic teak arms. Click here to view the Delray video! Click here to view the latest listing of Black Friday Pricing items! Quantities are limited, so order today! Call 610-994-1686 to speak with our representatives to discuss your project and help you identify the colors, stock, lead time, and budget to best fit your needs, or click Outdoor Restaurant Seating to shop at our site and read relevant articles. Outdoor Restaurant Seating offers the best value in indoor and outdoor commercial furniture including chairs, tables, barstools, sectionals, and accessories for restaurants, cafes, social clubs, and other organizations that offer dining experiences. Restaurant owners and managers depend on us to maximize space utilization, outdoor conditions, and high quality furniture to deliver comfortable accommodations for patrons and - most importantly - the best return on investment. If you are interested in our synthetic teak outdoor furniture, visit our other site: Synthetic Teak Furniture. 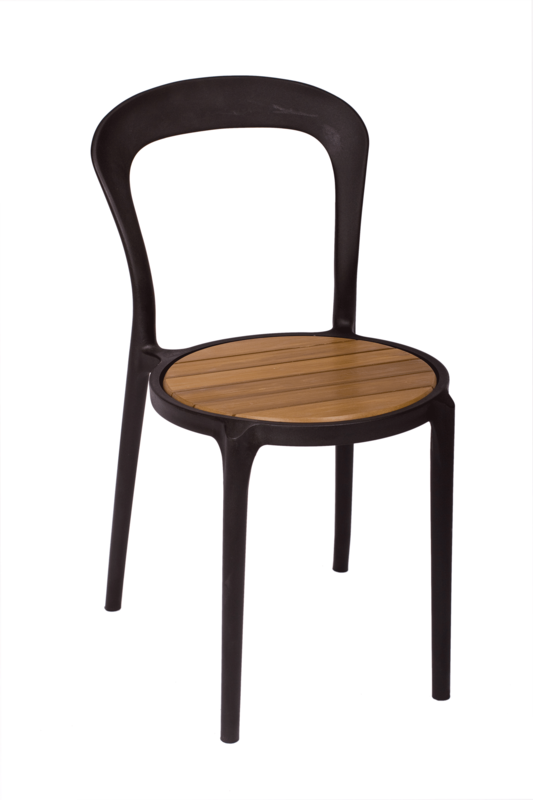 Wooden chairs add a touch of bygone-days character and aura to any establishment. Maybe it's that distinctive sound as the legs slide across the floor, evoking memories of carefree school days. Perhaps it's the natural look of woodgrain and the solid hefty feel of the chairs that makes them popular. On the other hand, similarly stylish metal seating has the advantage of lighter weight, sturdier construction, and generally lower cost. Neither choice entails a loss of quality or options, and you can find just what you need at Outdoor Restaurant Seating. Read more: Would Wood or Metal Make Better Indoor Restaurant Seating? 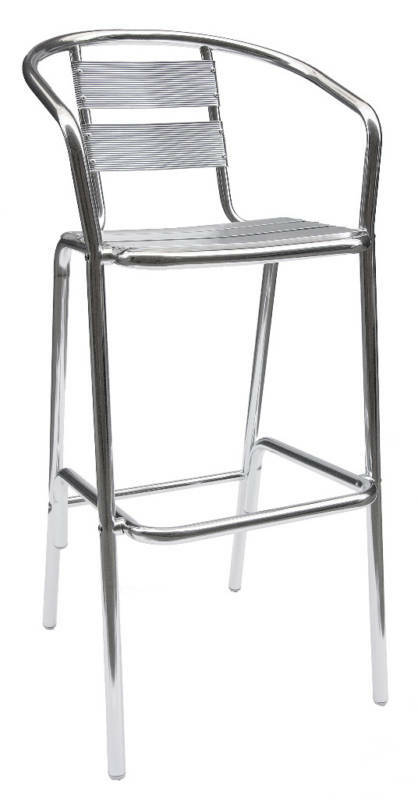 Previous articles have touted the advantages of our commercial indoor and outdoor barstools and counter-height stools for your dining, meeting, lounging, teaching, and cooking areas. 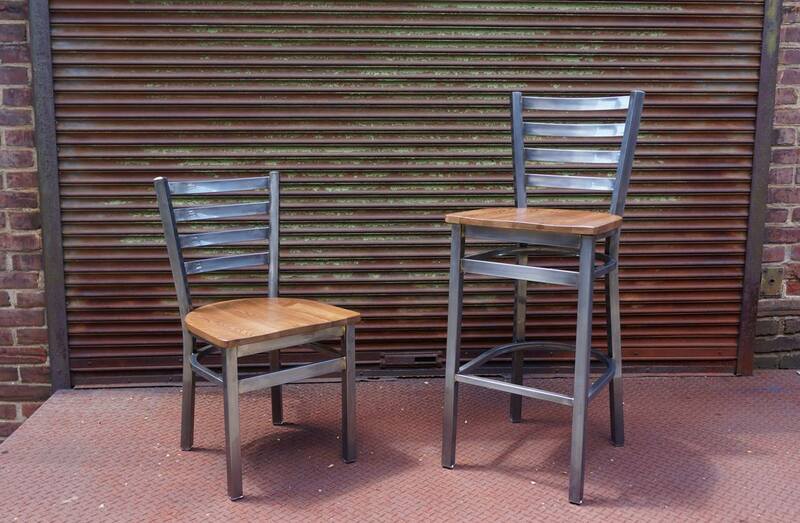 Outdoor Restaurant Seating is having a Special Closeout Sale on BFM Seating's Delray seating. Delray combines the advantages of a rugged powder-coated aluminum frame, batyline seat and back, and synthetic teak arm. Powder-coated aluminum is light, sturdy, easy to clean, and withstands harsh environmental conditions. Batyline is polyester fiber covered by a coating of PVC. It is impossible to tear and is 100% recyclable. Synthetic teak maintains the beauty and class of natural teak wood without the maintenance and wear. Select Delray arm and side chairs and arm and side barstools are on sale now for up to 60% and more off list price, our lowest prices ever! Whether you are in a climate that allows year-round outdoor dining, or move your patrons indoors for the cold season, you know holidays are busy times for restaurants and other dining venues. Many restaurants redecorate, refresh, and even upgrade their dining spaces for the holidays. With savings up to 33% and more on BFM Seating chairs and table tops and bases, now is the time to order your restaurant furniture for holiday upgrades or stock up for the next outdoor season! Click here to view the latest listing of Black Friday Sale items! Quantities are limited, so order today! Outdoor Restaurant Seating is having a Special Closeout Sale on BFM Seating's Delray seating. Delray combines the advantages of a rugged powder-coated aluminum frame, batyline seat and back, and synthetic teak arm. Click here to view the Delray video! Many restaurants redecorate, refresh, and even upgrade their dining spaces for the holidays. With savings up to 33% and more on BFM Seating chairs and table tops and bases, now is the time to order your restaurant furniture for holiday upgrades or stock up for the next outdoor season! Click here to view the latest listing of Black Friday Sale items! Quantities are limited, so order today! Items are updated often, so please check back! Call 610-994-1686 to speak with our representatives to discuss your project and help you identify the colors, stock, lead time, and budget to best fit your needs, or click Outdoor Restaurant Seating to shop at our site and read relevant articles. Outdoor Restaurant Seating offers the best value in indoor and outdoor commercial furniture including chairs, tables, barstools, sectionals, and accessories for restaurants, cafes, social clubs, and other organizations that offer dining experiences. Restaurant owners and managers depend on us to maximize space utilization, outdoor conditions, and high quality furniture to deliver comfortable accommodations for patrons and - most importantly - the best return on investment. Wooden chairs are a fine choice for your dining or meeting area. They come in popular colors and seating materials. However, one of the distinctives of each model is the design of the backrest. Different backs add unmistakable flavors to your design. All provide comfort and support for your patrons. There are solid backs, found in BFM's Merion and Dover sets. Vertical slats provide support in the BFM Cornell, Princeton, and Delran chairs and barstools. BFM's Burlington set features horizontal slats. If it's too hard to decide, the BFM Pennington lets you have it both ways with the stylish crosshatch pattern back! It it's REALLY hard to decide, try the BFM Trevor backless barstool. The backless design makes it easy to store the Trevor under a counter. It also makes it easier for a patron to turn around to talk with others or see the action. Whatever you choose, Outdoor Restaurant Seating and BFM Seating team up to provide you with wooden seating that will add charm and comfort to your establishment. 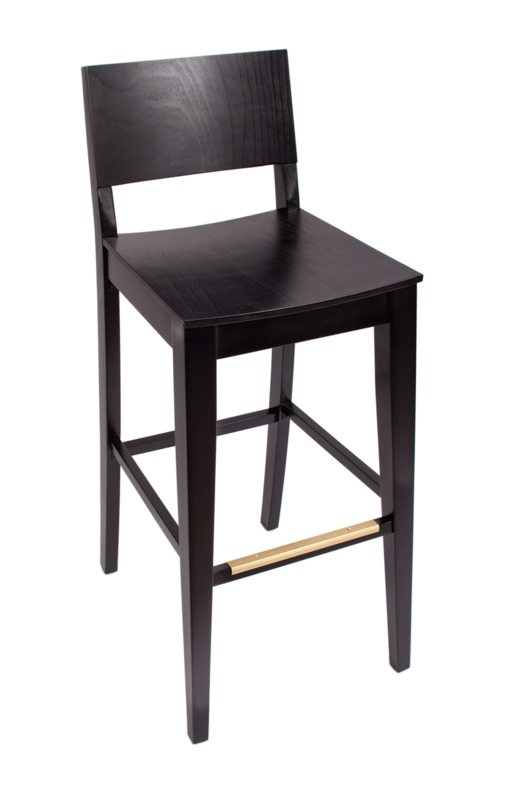 If it's REALLY hard to decide, try the BFM Trevor backless barstool. The backless design makes it easy to store the Trevor under a counter. It also makes it easier for a patron to turn around to talk with others or see the action. With savings up to 33% and more on BFM Seating chairs and table tops and bases, now is the time to order your restaurant furniture for holiday upgrades or stock up for the next outdoor season! Click here to review our latest Special Closeout Prices! When you hear the words "bar stool," what probably comes to mind is . . . a bar! But bar stools can be used for so much more. Any restaurant that has a countertop needs bar- or counter-height seating, as do many casual dining establishments where space is at a premium. 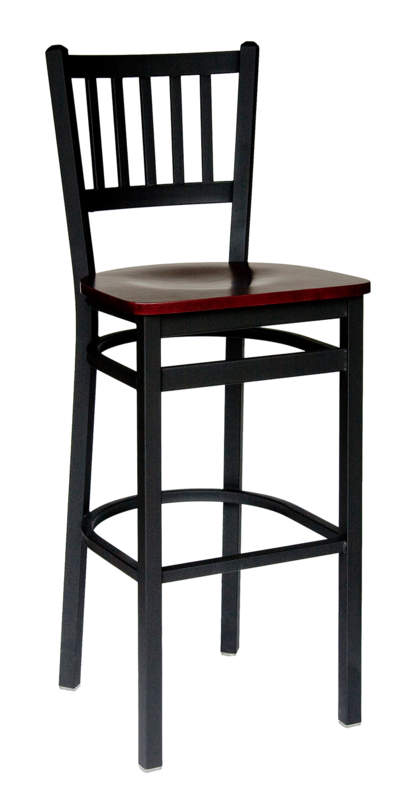 Bar stools can also be used at breakfast bars, pubs, and window-side dining areas where your patrons can grab a seat after picking up their favorite foods. Homeowners, you can equip your home bar or kitchen counter with bar stools that make sitting for a pancake breakfast or a few cocktails a comfortable experience. Bar stools make it easy to fit in right where the action is, so pull up a seat, relax, and shop for the best stools at Outdoor Restaurant Seating! The home kitchen is the area of the home where food and activity abound; therefore the kitchen brings out the best in people and their home. Counter-height kitchen chairs are perfect for giving meals a little lift. These let your guests or family keep you company so you don’t miss out on their lives while you’re preparing the meal. Adding a home bar to the kitchen or next to it, independent of the dining table, with bar stools included. The mood this creates for your home is casual yet classy, and is sure to be a winning combination in any home. Bar stools use space economically, they are ideal for both sitting and standing situations, and are surprisingly comfortable. It is often easier to get on and off stools, and backless stools can be pushed under the counter when not in use. Bar stools are popular in pool parlors and game rooms because they provide a bird's-eye view of the action. They also provide a bit of privacy so individuals can sit alone without taking up an entire table or facing across from a stranger. 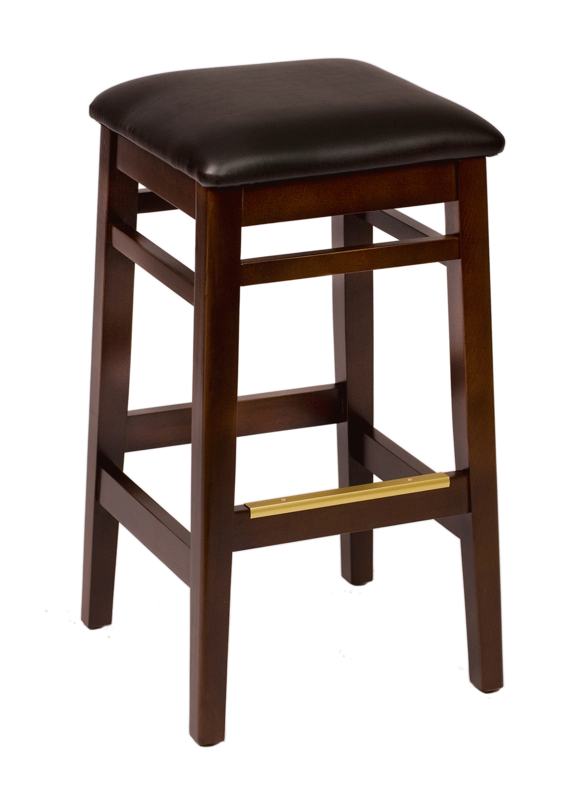 Be sure to take a look at as many different options as possible beforehand -- you will be surprised at how many different kinds of bar stools we carry! If you have an outdoor dining area, pub, bar, club, home bar, kitchen counter, classroom, lab, collaborative work space, gazebo, poolside, cafe, porch, balcony, game room or anything we haven't thought of, we have the right seating for you! What style of bar stool is best for my counter or bar? Look around your kitchen or bar and decide if you want your new stools to stand out or blend in with the color, style, and materials already present. For placement in a narrow hallway or next to a kitchen island, backless bar stools are a great choice, because they can be tucked out of the way under the counter overhang. 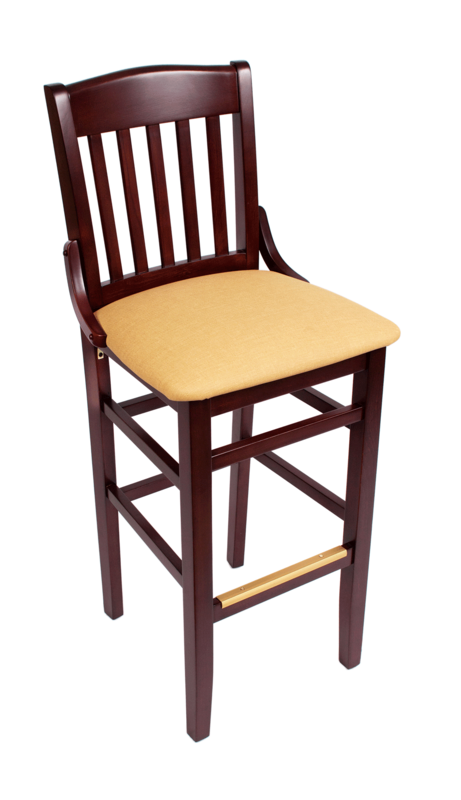 There are as many bar stool options as there are venues: metal, wood, padded, slat back, mesh back, batyline, backless, swivel, non-swivel, arms, armless, stackable, footring, no footring, synthetic teak, synthetic wicker, brass foot rest, and many assorted colors and materials. Don’t be afraid to mix and match, either. Metal bar stools can add contrast to a venue that is predominantly wood, and wooden bar stools can bring a bit of nature inside a modern, high gloss dining area. Wooden bar stools may not seem particularly edgy or sophisticated, but there is a certain class and appeal about sturdy, natural, solid wood. Wood's rich tones and timeless simplicity can accent your current decor or add subdued color to your dining area. 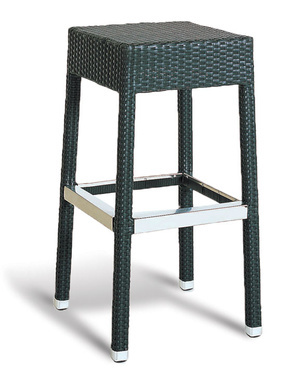 Customer type is a consideration when ordering bar stools from Outdoor Restaurant Furniture. 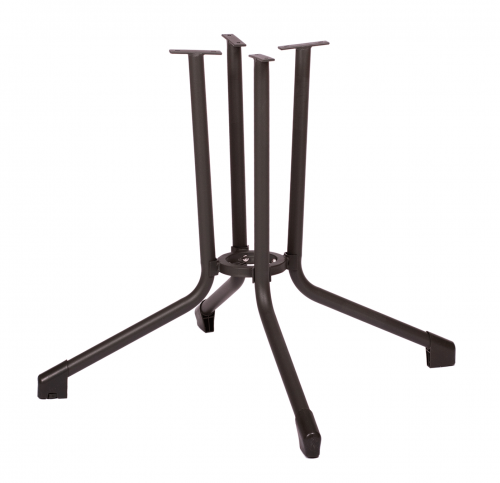 Swivel stools are ideal for busy, crowded venues; backed stools work well for longer sitting durations; and weight-appropriate materials are important. Our seating experts can help you decide what best fits your venue and budget. The new business trend of establishing collaborative workspaces where workers can brainstorm and socialize requires casual, comfortable, reliable seating, that often includes bar-height tables and seats. How do I choose the right height for my bar stools? The last thing you want is a stool that has you cramming your legs under the counter, so pay close attention to the height of the area you’ll be sitting at. You should also keep in mind the horizontal space around your bar stool. Six inches between each stool is optimal for socializing and eating, but if your dream bar or kitchen has swivel bar stools or stools with arms, you’ll want to add just a bit more space. With savings as high as 26% on BFM Seating chairs and table tops and bases, now is the time to order your restaurant furniture for holiday upgrades or stock up for the next outdoor season! Click here to view the latest listing of Pre-Holiday Sale items! Quantities are limited, so order today!